The Food Autonomy Festival (FAF) in Amsterdam is about presenting and celebrating alternatives and resistance to the state and corporate-controlled industrial food system. We are happy to announce the theme of this second edition: “Grassroots alternatives for a fossil free food system”. How can we move towards a fossil free agriculture and food system? During the FAF, various collectives will present concrete alternatives to become autonomous from agro-industrial corporations and fossil fuels. From practical activities to talks and debates on agroecology, urban farming and land struggles… Everyone will have the opportunity to contribute and be part of a necessary transition. Let’s get together to organise our fight against the industrial food system! The food sovereignty movement is a global alliance of farmers, growers, consumers and activists. Allowing communities control over the way food is produced, traded and consumed. It could create a food system that is designed to help people and the environment rather than make profits for multinational corporations. The concept of Food Sovereignty has been implemented at different levels, from a very theoretical point of view to a very practical one. During this talk, you will discover more about Food Sovereignty by approaching this topic from 3 different perspectives; research, education and farming perspective. Having speakers from autonomous spaces, aims to raise awareness about these experimental spaces which tend to resist against capitalist imperialism and to hear how they are aiming for self-improvement also in the field of food. This is why land is at the centre of many struggles around the world. Come and hear how different groups have gained access to land and how there are using it in order to break dependency on a system that becomes the cause of our demise. Our goal through this talk is to gather people from different places who have different way to fight against eviction, to talk how we can support each other and strengthen the connection. During this talk, two grassroot organisations, one from Amsterdam (ASEED Europe) and the other one from Denmark (KlimaKollektivet) will present their new campaigns which, in both cases, aim to tackle the use of Fossil Fuel in the agriculture field. Feel welcome to give your opinion and to ask your questions about the Fossil Free Agriculture and Free the Soil campaigns. And why not getting involved? Come and learn how to build a home made rocketstove made of wood! Mushrooms have been growing wild since prehistoric times. Their therapeutic value has been prized in indigenous cultures, for thousands of years. They play a critical role in medicinal practice and were noted in some of the first books on herbal medicine written thousands of years ago. Come and learn the basics of mushroom cultivation, explore various techniques for growing gourmet and medicinal mushrooms such as Oyster, Reishi, Shiitake and many other strains of mushrooms. This will be a hands-on experience we will cover everything you need to know to get you started. This workshop for beginners learns you to create a (scale model) foodforest for your backyard or bigger. Before and while we build the scale model foodforest together, you’ll be explained the theory and the practice of observing, designing, implementing and maintaining. It would be great to bring your own favourite edible scale model tree(s) and/or shrubs with you. Join us for an informative, hands-on and fun workshop on how to grow your own edible, urban garden in small spaces like balconies, window sills, allotments or roof terraces. Through this introduction workshop you will get an overview of which herbs, vegetables, edible flowers and small fruit are suitable for your growing area and can provide you with yummy and healthy food in different seasons! On top of it, a walk tour will be organized in the area with people from Bajesdorp to tell the story of the place. For all the workshop, the places will be limited, the tickets for each workshop will be available in the info table which will be set up next to ASEED stall! Seedling exchange – share your seed(ling)s! Three music bands will play on the evening. Vegan food available on donation throughout the day from 12pm from Taste Before You Waste and later from Guerilla Kitchen Amsterdam. 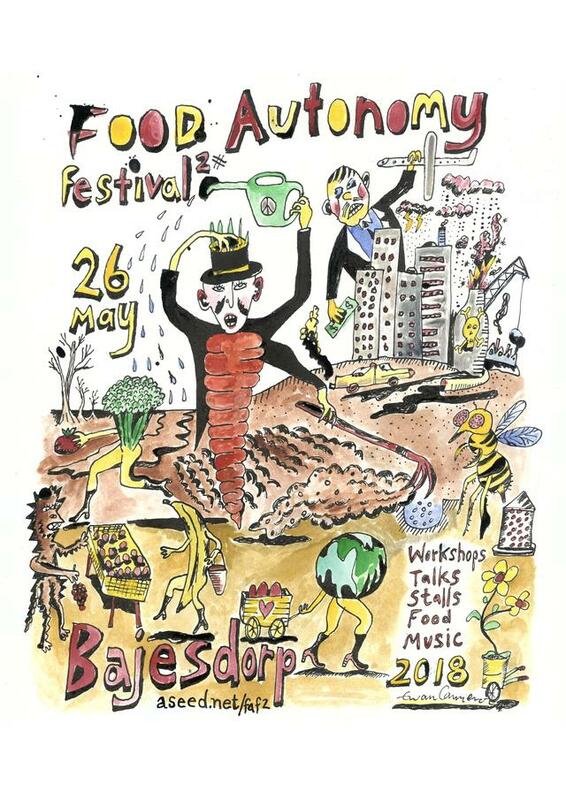 Join us in Bajesdorp the 26th of May from noon for a day of sharing, learning, connecting and having fun! LOCATION: The Bajesdorp (next to the Bijlmer Bajes (the old prison)) – The nearest metro is Spaklerweg (5mins walk). Nearest train station is Amstel Station (10/15mins walk). Better to come by bike, since the parking is very limited and not free if you park outside.